Unified Contact Center Reporting: Which works best in the Contact Center: Desktops/Dashboards/Wallboards? 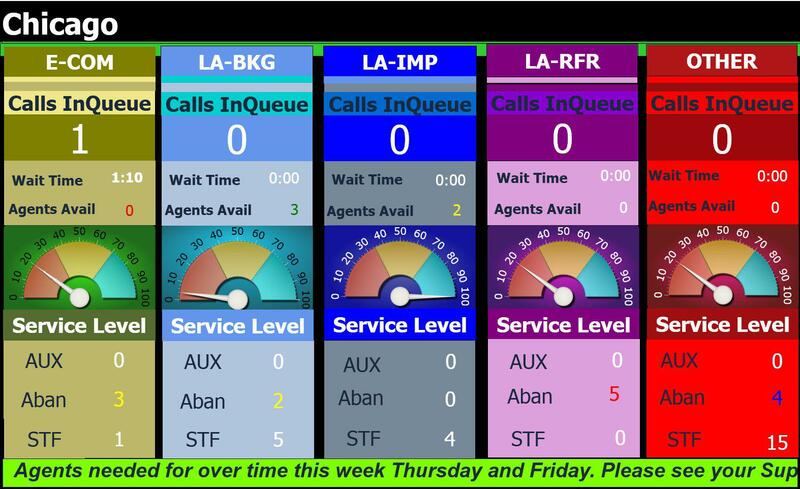 Which works best in the Contact Center: Desktops/Dashboards/Wallboards? Understand what each of the reporting tools can do for those that will use it. Contact center challenges occur in every contact center. Each center is different but all of them have challenges. Here is a brief list of 10 challenges: Agent turnover, complete awareness of duties and responsibilities, customer expectations increasing, budget cuts, business productivity, customer experience consequences, multi-channel data integration, brand knowledge, internal communications, schedule adherence, etc. Finding a solution to these challenges is a key to a successful contact center. Every contact center is segregated into multiple groups (queues) and each group can have different challenges. The manager should have a group meeting with the supervisors and define, in detail, the challenges that each group has that is affecting overall performance. Some of the challenges will be duplicated and some very unique to a group. The goal is to eliminate the critical challenges for each group. The target audience for the reporting specifies the type of reporting tools the contact center will need to have in place. If the audience crosses multiple groups and includes people outside of the contact center the reporting tools need to vary. What if there is remote or at-home agent? Every contact center has different audiences. Know the audience that will see the reporting applications as this will affect the tools that should be used. Defining the goals for the reporting tools is a requirement. Having a reporting tool with no goal in mind will result in a tool that “is not working”. Review the challenges and adjust the goals to help resolve those challenges. Goals also need to be prioritized. Give each goal a level of importance but do not allow all goals to have the same importance. Create a scorecard. Then review the goals for the target audiences and determine which audience is most important to the business. Reporting tools have different features, functions, benefits to the contact center. For this article we are focusing on desktops, dashboards and LCD screens. There are other types of reporting tools such as web based reporting, mobile reporting, email reporting and traditional LED wallboards. Desktop reporting is for the agents desktop. Dashboards are for the supervisors and managers. LCD Screens target the contact center group and other that are mobile within the contact center. Desktops: If the challenges within the contact center are with some agents, but vary by agent, the desktop reporting tool will help resolve the problems. For most contact centers the agents desktop reporting tool is going to be used to notify the agent of the current status of the group the agent works in. In a multi-channel contact center the agent may be handling calls, emails, and chats. Productivity can be difficult at times however being aware of the current status across all channels helps the agent perform. 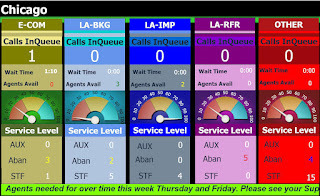 Displaying something as simple as a Call InQueue and Longest Wait time can be a tremendous productivity improvement. The desktop reporting can have agent specific information. This information can be confidential or kept confidential to keep the agents morale at a higher level. Sharing agent productivity information to the entire contact center can have a negative effect on the agents. This will depend on the type of group the agent is within. A sales related agent can have all productivity information shared. Desktops also support messaging to and from the agents. Communications within the contact center are needed but at times difficult to do at crucial times. Large contact centers makes it hard to communicate simple messages without a desktop messaging tool. These tools can also include real time metrics to congratulate an agent on improved performance. LCD Screens: Challenges within the contact center can be group related. Some of the issues might be product and service knowledge, group level performance issues, or for the smaller contact centers current status metrics. Agent specific data is usually not displayed because of the negative impact that can have with underperforming agents. It has been found that showing agent specific information causes agent turnover. Target audience is an important consideration with LCD screens. Knowing who will be seeing the LCD screens can and should change the content on the screens. The challenges within the group that few the screens on a regular basis will also change the content on the screens. As problems within the call center change so should the content on the screens. The content for LCD screens should change throughout the day. The information displayed is multi-channel data (voice, email, chat), business product and service information, external business content, messages, Live content and internal images. To remain effective the LCD screens need to be continually updated and migrate as new business challenges appear. Leaving the LCD screen with the same information turns the screen into artwork. 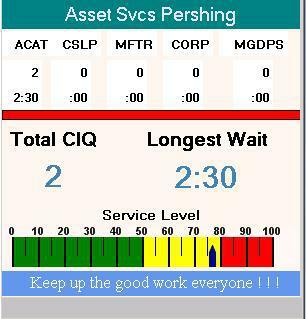 Dashboards: Supervisors and Managers are not a problem for the contact center. The challenge is getting a lot of data from multiple sources to managers so they are quickly able to see the current and historical status and performance for the contact center. 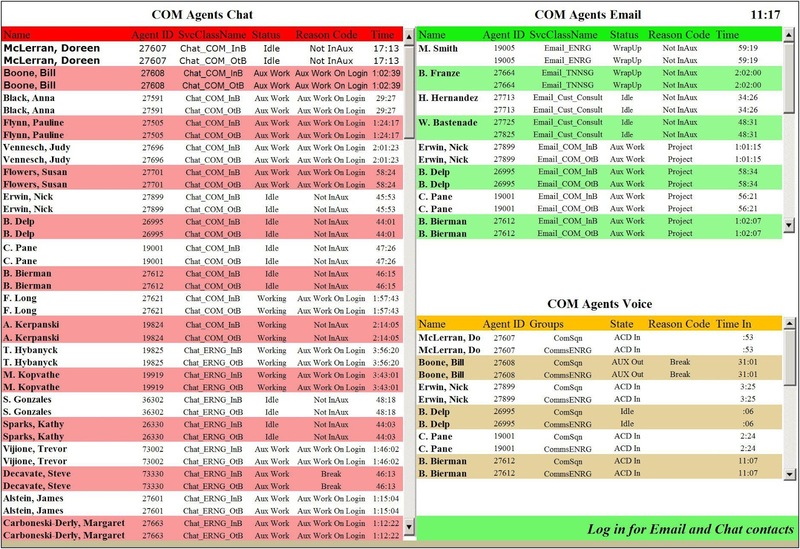 Dashboards should be used to combine data from voice, email and chat sources. Managers also have internal data that needs to be added to the dashboard. The goal is not to replace the reporting that is available for these other source but rather to combine them. Dashboards give east access to the summary data and drill down to detailed information. And when required the manager is able to go back to the original source and see very specific details as to the overall cause. The dashboard can have multiple tabs of content. Typically dashboards begin with a summary page and is followed up with tabs of specific data. As an example the summary page could be a combination of voice, email and chat. Three additional tabs with voice, email and chat on separate tabs provide details. Most managers have tabs for each group with columns for each data source. 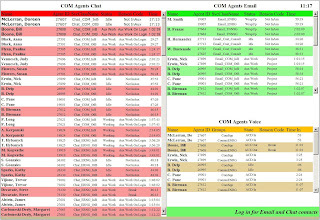 Next managers are able to see details on each agent for each of these multi-channel contacts the agents are responsible for. Below is an example of this type of dashboard. A combined dashboard will save the manager a tremendous amount of time. By combining data from multiple sources into one set of reports, the manager is able to see the cause and effect of agent performance. Real time data of agent productivity and the historical results per agent should be available through the dashboard. Manager and supervisor dashboards that contain the right data are able to reduce and eliminate some of the contact center challenges. The key to the successful dashboard is capturing and combining critical data targeted at the challenges that exist within the contact center. To minimize the problems that are occurring within your contact center focus on defining the problems, determining the cause of the problems and define the goals for the contact center. The reporting tool that works best for the contact center will be determined by the problems that contact center is experiencing.